Choosing the right tyres for your car – and correctly maintaining them – has multiple benefits. It can help improve your car’s safety and is good for fuel economy, which means lower overall running costs. A little tyre knowledge can help protect you from a blowout in the supermarket car park (or much worse, the motorway). If your car has defective tyres, you could be fined up to £2,500 and have 3 penalty points added to your driving licence (per car). If that wasn’t bad enough, VOSA (the body in charge of MOT tests) claims that defective tyres are responsible for 20% of all MOT failures – making it very important that you know when to change your tyres. There’s no way around it, tyres are an expensive purchase and many people put off replacing them for as long as possible. By law, tyres must have a tread depth of at least 1.6mm across ¾ of the tread width for the full circumference. However, by this point, the tyre’s ability to grip in wet and adverse conditions will have begun to deteriorate, so it is advisable to start looking for new tyres when the tread depth reaches 2-3mm. New tyres traditionally have a tread depth of around 8mm. It’s worth noting that if you have repaired a previously-damaged tyre, this can also effect whether or not it is considered legal. It’s always best to check with an expert to determine whether or not your tyre can be repaired and continue to be used on the roads. When buying new tyres, you will notice a series of numbers printed on the tyre sidewalls – these relate to the size, how the tyres are constructed and what speeds they are capable of traveling at. The numbers can help you make an informed choice when selecting replacement tyres. We recommend that when you change your tyres, you replace them with the same specification – if in doubt, ask your expert tyre fitter at a garage. Most cars are front wheel drive, so the front tyres wear more quickly than the rears, so they generally need replacing sooner. You can help to even out the wearing of your vehicle’s four tyres by switching the rears to the front before they are worn out. It is important to check tyre pressure at least once a month (and preferably every other visit to refuel). Most petrol stations offer tyre pressure measurement tools and handy gauges are available from all good motoring outlets – you can find your car’s recommended tyre pressure in the owner’s manual of the car. If a tyre’s pressure seems to be depleting rapidly, it’s likely to be caused by a small puncture. 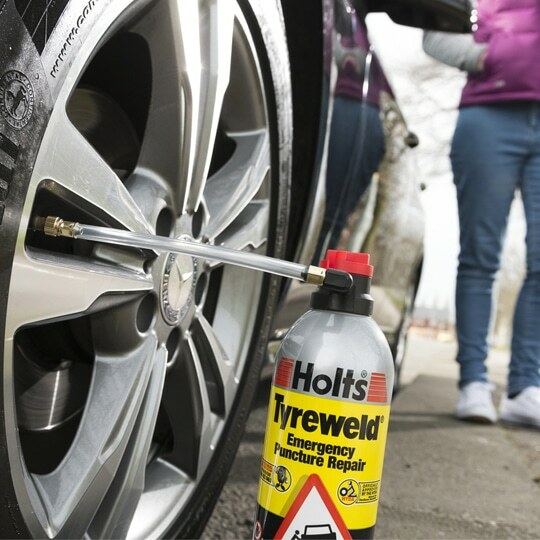 Holts Tyreweld sealant can help seal and inflate punctured tyres immediately. It’s quick and easy to use, to get you back on the road fast. Checking wheel alignment can also protect tyres from irregular and rapid wear, prolonging the life of tyres. This can also help improve road handling and save fuel.